To try and take down Apple’s super amazing personal voice assistant Siri, Samsung released the S Voice app along with their latest flagship Android device, the Galaxy S III. We’ve seen images and videos of S Voice in action and it’s nothing like Siri, it’s slow, takes much more steps to get answers and doesn’t recognize speech well. 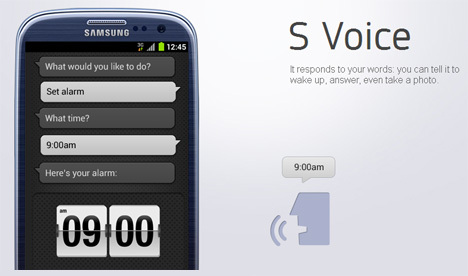 S Voice is supposed to be an app that is exclusive to the Galaxy S III, but we all know what happens to exclusive things. They get leaked, recreated or copied and given to the mass. That’s what has happened to this exclusive app too, thanks to a member of the XDA-Developers forum. He has managed to get the S Voice app from the device and has made it available for anyone who wants to try it out. Samsung is going to be very unhappy as this is the second Galaxy S III exclusive app that has been leaked. Flipboard for Android was also leaked earlier. The leaked S Voice apk will work on many Android devices and on various custom ROMS too. The installation instructions and the S Voice.apk can be found in the link below. Make sure you have Untrusted Sources checked in the Settings app when installing this app. Try it out and let us know if you like Samsung’s copy of Siri. Use the comments section.